** Early 20th Century Doulton terracotta sundial pedestal decorated with a pair of swans surmounted by a square bronze plate inscribed "TEMPUS FUGIT 1683"
19th Century Doulton stoneware sundial pedestal decorated with trailing wisteria and stamped 'Doulton Lambeth' surmounted by a bronze sundial plate indistinctly inscribed 'P Dolland, LONDON' together with a hexagonal stone base. ** Composition stone geometric design sundial pedestal surmounted by a large brass plate inscribed and dated "2000"
"TERRA COTTA, M H BLANCHARD & CO, Blackfriars Road, London"
surmounted by a later brass armillary sphere stamped "WESTWOOD DIALS ENGLAND"
** 20th Century sundial in the form of a hexagonal composition stone pedestal surmounted by an octagonal bronze plate inscribed "A Span of thyme art I"
Heliochronometers are extremely precise forms of sundial capable of accuracy within one minute assuming it is in sunlight. Invented at the end of the 19th Century with the introduction of Greenwich Mean Time in Britain. Up until this time each major city in the UK had its own local time but with the expansion of the railway network a standardised time was necessitated. "Thomas Grice 1705 Seize the present moment the evening hour is nigh"
Although sundials have been in existence for over 2000 years they were not common place in England until the 17th Century when vertical dials were regularly incorporated into the fabric of public buildings such as churches. together with affordable accurate clocks and watches brought about the demise of the sundial as a reliable means of telling the time. Throughout the 20th Century up to the present time garden sundials have continued to be produced for primarily decorative purposes. 17th, 18th or 19th Century original or a later reproduction? One of the questions most commonly raised to us is "I have an old sundial plate with a 17th or 18th Century date on it, is it genuinely of this age?" Unfortunately there are numerous examples of sundial plates bearing what purport to be 17th and 18th Century dates such as "1661" or 1705" however these were massed produced during the 20th Century. These spurious dates are confusing but as a simple guide the 20th Century reproductions tended to be made from cast brass with relatively poor definition in the numerals and decoration together with mottos in Latin or English. 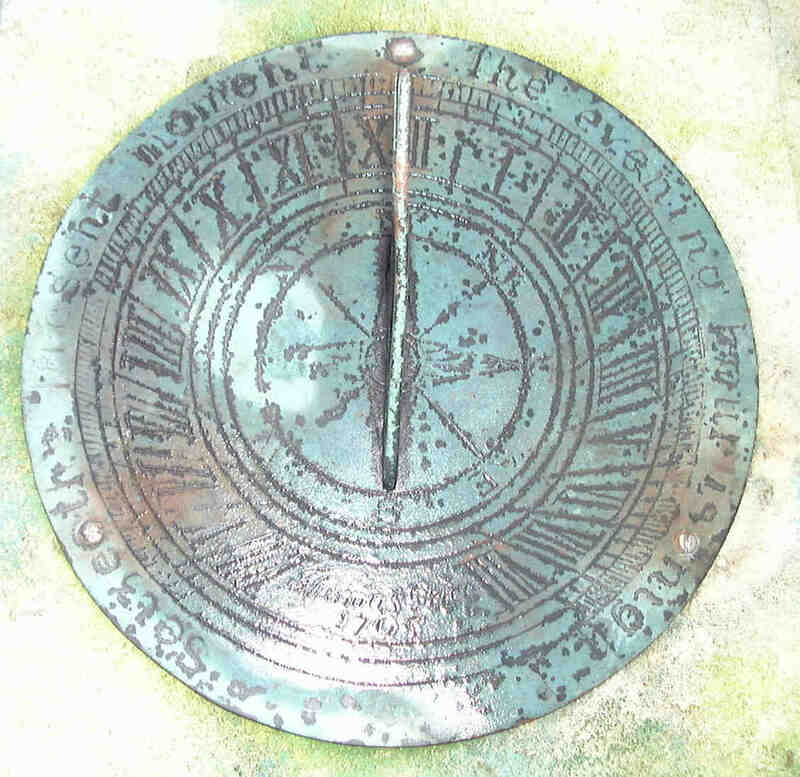 Whereas the 17th to 19th Century originals would be have been true scientific instruments made from bronze, slate or copper with inscribed / engraved numerals and decoration normally together with the makers name and a latitude for where the sundial has been designed to be used. In summary a bronze or slate sundial plate with engraved numerals and decoration together with a makers name is more likely to be an 18th or 19th Century original. but without a makers name is more than likely to be a 20th Century reproduction. A makers name however is not necessarily an indication of age since at the end of the 20th Century a large quantity of reproduction brass sundials measuring 9.75" (25cm) diameter were cast with the details "Thomas Grice 1705 Seize the present moment the evening hour is nigh"
There are exceptions to these guidelines but we hope they help in determining the age of sundial plates. Adjacent are some images intended to help determine whether the sundial is a modern reproduction or a genuine original.